Donald Sterling makes Rush Limbaugh look like Martin Luther King Jr. Think what you will of Limbaugh and his knack for making what many consider to be inflammatory, race-baiting statements, but his short-lived attempt to become an NFL owner isn't nearly as problematic as Sterling's already being an NBA owner. I'm not referring to Sterling's well-documented mismanagement of the Los Angeles Clippers, who have had just two winning seasons (and one .500 record) since he bought them in 1981. I'm talking about the $2.725 million Sterling and his wife agreed to pay Tuesday to settle a federal lawsuit in a historic housing discrimination case in Southern California. Sterling was prosecuted by the U.S. Justice Department for discriminating against prospective Hispanic and black tenants. Assuming the settlement is accepted by a U.S. district judge, Sterling will have the special distinction of giving the Justice Department the largest payout ever for a case involving apartment rentals. You would think NBA commissioner David Stern, who is extremely sensitive about the league's image, would have a strong rebuke, a significant fine and a suspension in store for Sterling. Instead, the commissioner has offered only disappointing silence. I e-mailed the NBA office for a response on Wednesday and was told Stern has nothing to say, for now. I'm sure if Sterling were wearing a throwback, sporting cornrows or named Mark Cuban, we would have heard from the commissioner by now. If you think Sterling's business practices aren't the NBA's concern, you need to read this thorough and disturbing story on Sterling by ESPN The Magazine's Peter Keating. This federal lawsuit wasn't an aberration but part of an alarming racist pattern. In 2003, some of Sterling's tenants filed a housing discrimination suit against him, alleging -- among other things -- that Sterling didn't want any black or brown folks in one of his apartment buildings. Nor did he want any children. 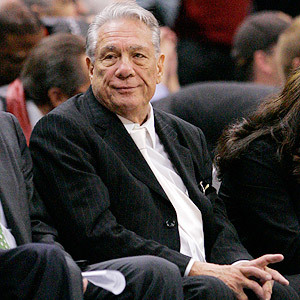 AP Photo/Mark J. Terrill How much longer can the NBA put up with Donald Sterling's insensitivity? If you had the misfortune of belonging to the wrong ethnic group while you lived in one of Sterling's buildings, your rent checks were refused, you were harassed, threatened or evicted and the Clippers might make the playoffs before anything was repaired in your apartment. One of Sterling's property managers testified that after Sterling bought one apartment building, the new owner remarked that the building carried a stench because "all the blacks in this building, they smell, they're not clean. And it's because of all of the Mexicans that just sit around and smoke and drink all day." That suit was settled confidentially in 2005. Limbaugh has pushed the line -- and certainly stepped across it more than a few times -- with his commentary. But nothing Limbaugh has said -- or even has been rumored to have said -- comes close to some of the things Sterling is accused of saying behind closed doors about racial-ethnic groups. Sterling is making the league look bad, and its apparent indifference toward Sterling's legal issues is making the NBA look even worse. If a player were involved in something this unseemly, Stern would have issued a reprimand quicker than you could say "salary cap." When controversy erupted over the coarse rap song Allen Iverson recorded in 2000, Stern quickly issued a statement calling the lyrics "repugnant" and even held a meeting with Iverson, who eventually changed the lyrics. Iverson had to be scolded because, fair or not, he is always a representative of the NBA and its business interests. But so is Sterling. By doing nothing, Stern is fueling the perception that the league caters to the old boys' club, whether the old boys are in an executive's chair or a floor seat. The NBA should treat Sterling the way Major League Baseball treated the late Marge Schott, who owned the Cincinnati Reds. Schott was suspended from baseball for more than a year and fined $25,000 for her racially insensitive remarks. It doesn't matter that Sterling, in a statement from his attorney, continues to maintain he did nothing wrong and that settling these suits is just smart business. The NBA would be more than justified to hand down a severe penalty because the discrimination lawsuits represent only a portion of the humiliation and bad publicity Sterling has brought to the league. He has reached confidential settlements, for example, in two sexual harassment cases. And let's not forget that former Clippers GM Elgin Baylor is suing Sterling for employment discrimination, alleging things that are similar to what has been said about Sterling in previous discrimination suits. If Limbaugh's loudmouth act made him a bad fit for the NFL, having someone with a history of racist and misogynistic behavior running a team is a slap in the face to the large number of minority fans who support the NBA. It also takes some of the luster off the "A" grade the NBA received on the 2009 Racial and Gender Report Card from the Institute for Diversity and Ethics in Sport. Obviously, Sterling can't be forced to give up his team. But he should receive just as much public condemnation as Limbaugh did -- probably even more. NFL players were very outspoken about not wanting to play for Limbaugh, and although I don't expect any of Sterling's players to openly criticize the man responsible for their handsome salaries, what's stopping other NBA players from speaking out? Why haven't we heard from Derek Fisher, the players' association president, or Billy Hunter, its executive director? Limbaugh is polarizing, and therefore an easy target. It's one thing to exclude someone from joining a special club; apparently, it's another to ostracize someone who already belongs. Jemele Hill can be reached at jemeleespn@gmail.com.